ONE of the most ticklish aspects of the whole video tape operation is the manufacture of the tape itself. In these photos taken at the new ORRadio plant in Opelika, Ala., we can see some of the inspection steps used to insure perfect tape—which will “play back” a signal just about indistinguishable from a live telecast. 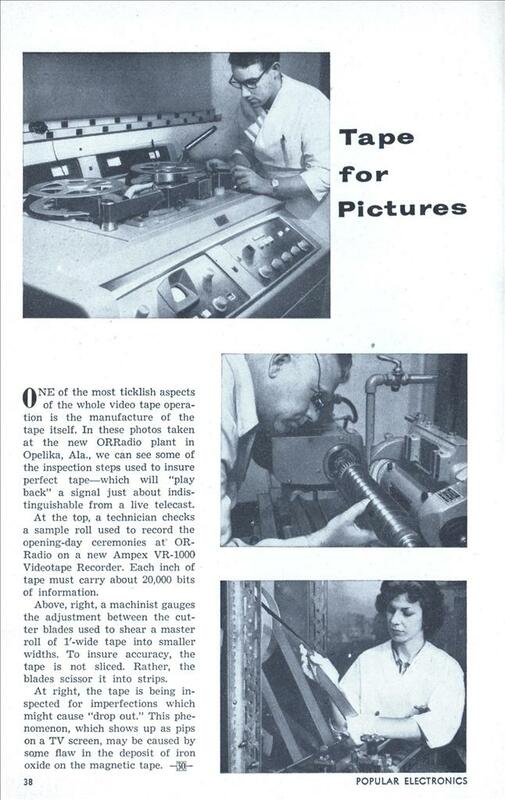 At the top, a technician checks a sample roll used to record the opening-day ceremonies at’ ORRadio on a new Ampex VR-1000 Videotape Recorder. Each inch of tape must carry about 20,000 bits of information. Above, right, a machinist gauges the adjustment between the cutter blades used to shear a master roll of 1′-wide tape into smaller widths. To insure accuracy, the tape is not sliced. Rather, the blades scissor it into strips. At right, the tape is being inspected for imperfections which might cause “drop out.” This phenomenon, which shows up as pips on a TV screen, may be caused by some flaw in the deposit of iron oxide on the magnetic tape. It’ll never catch on, too complicated. I’m trying to figure out the reference to “20,000 bits of information”; 1 inch of what looks like 2 inch wide tape – according to wikipedia (http://en.wikipedia.org…) the VR-1000 used a quad-head rotating “vertically” across the tape at 14,000+ RPM, with the tape moving at 15 inches-per-second (IPS), so I suppose 1 inch could hold only about 2.5 Kb. I guess what is throwing me is the reference to “bits”. 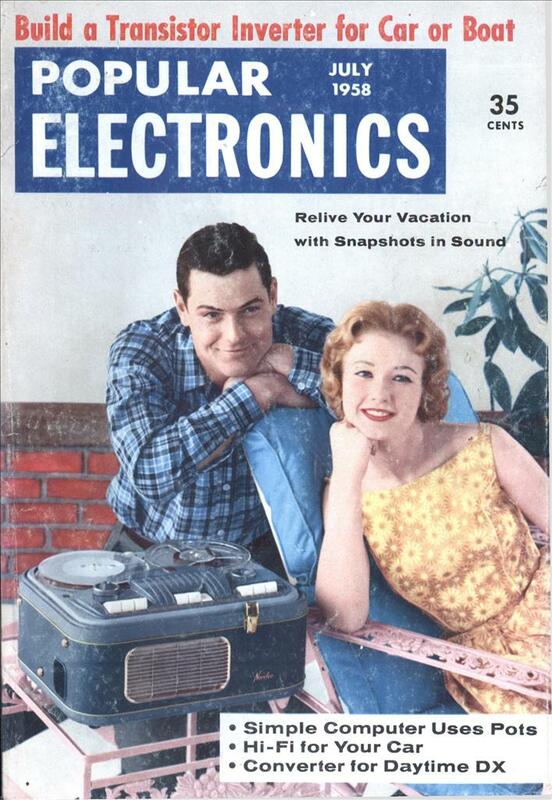 I’m currently reading the 1950’s decade of PopSci on Google Books; right now I am at the beginning of 1956, and there have been only a few articles on computing at all since the start of the decade, and little advertisement of anything (a few Bell Telephone ads, some RCA ads – which is all strange, since there were tons of ads and articles in the decade prior about ENIAC and such during and just after WW2). Most articles and such dealing with television don’t talk about “bits”, so I am wondering when this transition began? I suppose I will find out as I progress (I’m not sure why I chose “1950s” to read PopSci; I think I wanted something prior to the space-race, but post WW2, to see how the times and such changed from PopSci’s perspective – it’s been really interesting reading, all the same!). Oh – I should also note that what is really strange about the “bits” reference is the fact the signal applied to the tape was analog, not digital – so why reference “bits” at all? Unless the writer of the article got something mixed up from the rep at Ampex, who likely also manufactured and used the same or similar tape for computer storage of the era. Not sure if 20,000 bits-per-inch tape was considered a large amount for the time or not, compared to other manufacturers (it sounds like it might have been, though). Maybe the “bits’ are particles of iron oxide. The “Quad” 2″ format of video tape had rotating video heads that rotated at 90 degrees from the movement of the tape. The whole purpose of rotating video heads is to create a very high effective write speed for the head to tape surface. I think the term “bits” is used more towards the number of horizontal video lines recorded on a linear inch of recording tape. The recording was strictly an analogue FM modulated signal. There wasn’t anything remotely digital recorded in that era. The term bit and pixel were not even coined at that time. Those are terms used only for computer and digital systems. I think the author used bit as more of a synonym for “piece” or “segment” Since I am a broadcast video engineer, I’m not that well versed in computer technology of that time. I’m not even sure if they were saving computer data on tape in the late 1950s. In any case, I’m sure the early digital tape storage used a multi-track, linear recording. The record heads were stationary. Today’s digital tape backup systems do use rotating heads. While you are correct that multi-track linear technology stayed the “standard” for a long time, I can certainly see Ampex experimenting with the concept of packing more data per inch of tape using rotating heads (though I haven’t looked to see if anything went into production). I know there wasn’t anything “digitally recorded” at that time; certainly not video, but I do know there was experimentation in audio (mostly by Bell Labs). You are probably correct in the interpretation of the word “bits”, but this was a recognized word in computing then, so it is very possible (though maybe unlikely) that an Ampex rep was referring to possible data storage capabilities for digital computers of the era. The “Bit” as a measure of information, has already been defined by Claude Elwood Shannon in 1948. From that point on, it was possible to determine and compare amounts of information. His theory also includes the capacity of analogue channels. So you can very well use it to determine how much information you can record on audio tape. The 2 inch of tape give about a dozend of lines. So that would be about 1700 bits per line. So I can only assume they were talking about the maximum frequency recorded. Thanks for the info on the computer history. I am a video person and will admit my ignorance about the time period certain computer words were coined. I have extensive experience with all formats of video tape machines. To record a 5 MHz bandwidth, a relative recording/playback head to tape speed of approximately 1500 inches/sec was required with the head technology available at the time. (1500 ips is not a typo !). This equates to 125 ft/second – or about 85 miles/hour if recording was to be made in a linear fashion like an audio tape recorder. A required speed of 1500 ips would consume 450,000 ft (85 miles worth) of tape every hour by recording video on a single linear track ! Clearly, there had to be a way around this problem. The solution was to transversely record each field of video across the tape – a method called scanning. To achieve a relative head to tape speed of 450,000 ft/hour (85 MPH) , the tape moved at a speed of just 15 inches/second through the transport. It then passed over a head drum that had 4 recording heads (Thus the name Quadraplex) set 90 degrees apart spinning at 14,400 rpm. This gave an effective head to tape speed of 1500 inches/second! (do the math !) Not only did it effectively get the head to tape speed up to 1500 ips, it made full use of the magnetic tape by recording the sweeps of video transversely across the tape! Each head recorded 16 (not 12) lines of video, or 64 lines for each drum revolution or 4 revolutions/field = 8 revolutions/frame. Still don’t know about the bits though since that comes to 1024 horizontal lines recorded on one inch of tape. Using today’s standard of 640 pixels per horizontal line and using 8 bits to define each pixel that would be well over 5 million “bits” per inch of tape. The machine also produced a real loud high pitched whine which over the years blew my ears to bits.